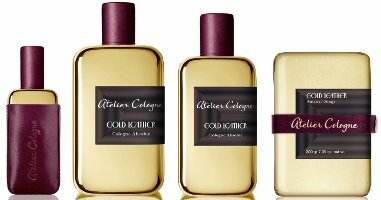 Atelier Cologne introduced Gold Leather in 2013, as part of the new Collection Métal fragrance series that also included Silver Iris. Like Angie, I thought Silver Iris was nice enough, but it couldn't compete with the fabulous iris fragrances already in my collection. Gold Leather, which seems to be less widely distributed, was much more interesting to me after a quick sniff on paper. Gold Leather starts off boozy and rich, with a sweet, spicy rum (although it smells like something heavier) and a twist or three of orange peel. There's a generous dollop of plum jam — the first few minutes are much like a dessert cocktail, or maybe more like a dessert (it's almost chocolate-y in the very early stages) and a cocktail. It's strong and loud: if you object to smelling like booze, even for a short time, this one is not for you. After that, it calms, slowly, into a very soft and smooth woody leather, almost more like suede, but given some darkness by gaiac wood and a mild oud accord. There is something that smells briefly like tobacco leaf in the early stages, and the eucalyptus is noticeable enough to provide some brightness, but not overwhelming, ditto on the saffron, which is hard to pick up until the plum starts to recede (the notes: bitter orange, saffron, rum, plum, davana, eucalyptus, gaiac wood, cedarwood, leather and oud accord). The dry down is considerably quieter than the opening, but it's far from sheer, and the lasting power is excellent — it will easily make it through your work day and then some. 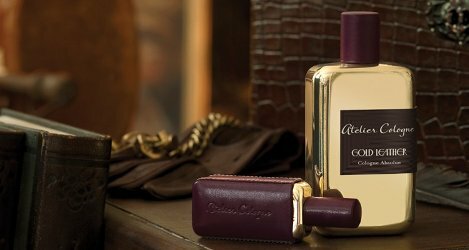 Verdict: Gold Leather is nicely done, and if your main complaint about Atelier Cologne is that the fragrances are too light and plain, it might please you. It's certainly the deepest and strongest scent they've done so far, and it's probably more suited to cool weather wear. Again, I feel about Gold Leather much like Angie did about Silver Iris — my enthusiasm after the first sniff on a paper blotter did not last through repeated wearings, when the sweetness of the opening began to wear on me, and the relatively mellow dry down seemed like too much of a contrast. I would say I'm in "strong like", but not quite love. If they were selling this one in 30 ml bottles, and I ever saw one at a good price, I'd consider it, but it's not going on my buy list. In the end I think I prefer the more subtle Lubin Idole, but if that one is too wimpy for you, or if you've never found your perfect leather (or booze) scent, Gold Leather is very much worth a try. My own favorite from Atelier so far is still the charming one-off Sous le toit de Paris. Do chime in with your own favorite leather or boozy fragrances, or both. Atelier Cologne Gold Leather Cologne Absolue was developed by perfumer Jérome Epinette. It is $195 for 100 ml and $295 for 200 ml + a 30 ml travel spray. There is also a coffret with the 100 ml bottle and a soap for $215; the soap on its own is $19.50, and a matching candle is $65. For buying information, see the listing Atelier Cologne under Perfume Houses. In the US, Gold Leather appears to be exclusive to Neiman Marcus as of this writing. Brought samples from this line with me to Vegas to see if their light-ness would seem more appropriate in the heat. Sadly, they are still too faint to be interesting to me (and one of them gave me a distinct dill pickle note). Glad to hear that they have at least one scent with more going on, although I’m not sure how I’d feel smelling like liquor, since I don’t drink! On the other hand, I like leather, especially softer leathers, and plum and tobacco leaf sounds like it could be nice. Yeah–sitting by the pool as I type this! I have this cute, red retro halter-style one-piece suit with a little ruffle around the base. I feel a little like Marilyn Monroe. Don’t have my samples in front of me right now, but I’ll try to report back about the pickles once I’m back in my room! Ok. Just popped into my room, and I have to apologize–I’m a big liar! The one that smelled of dill pickles was Ninfeo Mio, NOT one of the Ateliers. Ah well. On a nearly unrelated note, I just put on some Eau Radieuse (from a sample vial) and am surprised to discover that with my sun-sensitized skin, it *stings*! It feels like I’ve just put straight peppermint essential oil on my inner elbow, and it’s even turning a touch red! Never have had that reaction before. Wrists and neck seem ok, at least. . .
You know, I have had that happen to me sometimes after exercise! The first time, it was with something vintage (Crepe de Chine) and I got worried I was allergic to oakmoss but then it happened again with the contemporary Miss Dior Originale, which, if only that had oakmoss! I really don’t have a good explanation for why that should be… Any guesses on your end? Hope it goes away for you soon! Yeah, took a Benadryl, just to be safe. Hopefully won’t make me want to nap through my vacation! Funny about the exercise thing! Hadn’t heard of that. I can’t recall ever having a reaction before to a scent, and I’m *pretty* sure that I’ve sniffed this one before. . . and you’d think I’d remember reacting to it. . . I dunno. The scientist in me says it just means I need to do more testing! On the plus side, of all the warmer-weather scents I’ve resampled so far on vacation, I’m enjoying this one the most. Hey, what have you smelled in Vegas so far? And hope it’s sunny & warm! I haven’t gone sniffing at all yet! Maybe this afternoon. My good friend I’m here with got food poisoning or something and wasn’t up for an adventure yesterday, so I just sort of wandered around on my own. She made me promise to take her sniffing together, so hopefully she’ll be up to it this afternoon. It is glorious–80 degrees at least, and the nights have stayed plenty warm for evening ramblings! Thank you! Waving to you, Marjorie Rose, and hoping you and your friend have lots of fun on your holiday. (I thought you were there with Mr. Spicebomb). Heya, back! No Mr. Spicebomb for a few days. . . this is a girls’ trip! Just heard from my friend, and she’s sounding pretty chipper after a nap. Gonna head back over to the hotel (after some solo sniffing–sad to report no extraits to sniff at the Chanel boutique). Having a good trip, thanks! Oh, and can report to all that I just sniffed Silver Iris at a Vegas Sephora’s but they didn’t have this one, yet. Nor the new Spicebomb. Hmm maybe I will have to give this one another shot, as I love Idole but I’ve only ever tried it in EDP, which is reasonably “present”. Also, I’ll be curious to hear your opinion if you end up sniffing the Maison Martin Margiela Jazz Club–I just sniffed it in passing an hour ago (!) but it definitely had the boozy leather angle as well. Interesting. Still haven’t smelled any of the Replica scents, but if my local Sephora has them, I will! To my nose, this is way boozier (and fruitier, and sweeter) than Idole. This is one I have to try! You had me at boozy and leather, but plum and most of the other notes are all things I love! I own two Atelier Cologne scents: Oolong Infini and Mistral Patchouli. This is the first I’ve heard of Maison Martin Margiela Jazz Club. I’ve got several boozy perfumes, but it’s past my bedtime so I can only think of Jungle Elephant. This does sound nice – since I do like Idole… But then I remember Idole reminding me a little of Volutes EDP and Volutes EDP reminds me of Isabey’s Ambre d’Carthage. This whole group appeals to me – but I’v never actually made the decision to buy one. Very recently I tried Etro’s Gomma and I think its by far my favorite leather so far! Gosh, I cannot remember Gomma at all — I probably smelled it in 2004 or something like that. I do like leather in theory, but don’t think I own any of the really deep leathers. Diorling is fabulous. I would buy that if I found it. I almost fell out of my chair. It’s crazy good. I haven’t smelled either in vintage but I think I have tried current formulations. I can’t remember either very well but don’t think either appealed to me that much. (Then again i tend to get the classical Diors mixed up). Like you I may have preferred Eau Legere to the original BV, but I just can’t imagine myself actually wearing it! Gomma has a somewhat rubbery smell. Perhaps comparable to Bulgari Black but less sweet and overall more austere. CH, can you say more about MMM’s Jazz Club? Oh cool that’s somewhat like Black–that’s very tempting to me! So with the huge caveat that I only smelled Jazz Club on paper, I’d generally agree with the Fragrantica poll that names rum (at once sweetish and spiced) and leather as the predominant notes–it def packs some oomph and it didn’t immediately project the subtlety of composition that Idole has–but maybe one would detect more nuance if sprayed on skin? At the same time, it’s fairly smooth and immediately appealing, and didn’t seem to have the same rough-hewn, maybe even not-quite-finished quality that the Bois de Jasmin review of Gold Leather mentions. I’d guess it’ll get a reputation as a good and accessible (in the olfactory sense) boozy leather, although how many perfumistas will feel it’s worth going in for 100mls (currently priced here at 135USD), I don’t know. Haha ok, how’s that for equivocation?! I wish I’d put some on skin now! Oops, it’s actually $125. Could have sworn the SA said $135. Thanks for the review, CH! My pleasure! But now that I’ve got it on skin I want to amend–the smooth boozy aspect disappeared really quickly, and now I’d say it has more in common Eau des Baux, or more distantly, Spicebomb (maybe even Tea for Two, although I haven’t smelled that in quite sometime) than Idole. Dry and spicy, fairly roughed up. It does give something of the tickle-in-your-throat effect of being in a smoky bar, but it’s a little bit funny that their ad copy names the jazz club as being in Brooklyn in 2013, since you can’t smoke inside anymore… an underground club, I guess we’re meant to imagine? I really like Gomma, too, Merlin. For some reason, it always makes me think of that type of natural leather that is light in color when you buy it, but turns a darker tan with time and contact. I need to smell it again with this in mind! Yes, haven’t been able to find Gold Leather in Vancouver. Definitely hope that Atelier is not discontinuing their perfect-sized 30 ml bottles. My favourite (okay, only) boozy perfume is Delrae Bois de Paradis, and my favourite leather perfume, if suede counts, is Cuir de Lancôme. Not really sure why it’s so much more limited than Silver Iris, but seems to be in only a few stores. I think in the UK it’s Selfridges. And don’t think they’re getting rid of the 30 ml, just that they’re presenting these 2 as more upscale than the others. The 30 mls, for now, seem to be only available if you buy the 200 ml. I probably wasn’t clear — I meant the 30 ml only with the 200 ml just for the two metal ones — Silver Iris & Gold Leather. I thought it to be another variation of the ideas found in Tom Ford Tuscan Leather. At first i didn’t enjoy it too much due to this, but after i finished wearing my generous sample i thought it quite lovely. It also reminds me of Byredo Accord Oud somehow. I guess, although the Tom Ford is way more leathery, less smoothed over, than this. To me, anyway. It’s a more traditionally masculine scent. But they do both have fruit & saffron. Wonder if it’s possible any more to do any fragrance that doesn’t seem like a variation on the ideas of something else! The minute I smelled this on paper I thought of the Lubin. Wish i could smell leather on Tom Ford Tuscan leather. To me, something on that leather material they use smell only of tobacco, not leather, so i always get fruity flavored tobacco on Tuscan Leather and its descendants. Well, i guess that if something is successful, they will copy it or make it appear in another suit. It may be the best recognition of relevance that a brand might have nowadays. I tried out Gold Leather at Neiman Marcus not too long after it was released, and I liked it quite a bit. It reminded me of a cross between Lubin Idole and Voluspa’s Warm Perique Tabac candle (which I confess to rubbing the wax and applying it to my wrists like a solid perfume – since it’s coconut wax it worked reasonably well). I could see buying it if they sold a 30ml bottle, or even if Silver Iris and Gold Leather came in a 30ml coffret together, I’d consider it. I will have to smell that candle! Wasn’t Lubin Idole slated to be discontinued? Although it is still available on Luckyscent. I like Frapin Caravelle Epicee and 1697 for booze. It’s hard to beat Pd’E Cuir Ottoman and Knize Ten for leather (although there are certainly a lot of others that I love, too). Thierry Mugler did leather versions of Angel, Alien, etc., that sounded good. I have not tried them, but they may be relevant to this discussion about gussied up leather. Correction: the Idole EdP in the black bottle is still available on Luckyscent. The original version in the textured, clear glass bottle is no longer there. I think what happened is that they discontinued the EdT and left the EdP. You’re right, that’s it. Sounds like many Idole fans like the EdP better, anyway, but it’s a shame they didn’t keep the wonderful original bottle. Sounds interesting. Wonder if it will hit the UK? Favorite leather fragrance is Mark Birley Charles Street. Another I have not smelled! With the exception of Chanel 18! To me it smells like Grappa in the beginning and I like the extremely clean effect without smelling like detergent. Cuir de Russie … yum. I’m quite booze friendly ;)……..but this one’s opening hour was too much for me which is a shame since I very much like it after that. Would second the Frapins Nozknoz mentioned above but 2 of my favourite leathers are Cuir de Russie and Bottega Veneta – also love Prada’s Cuir Ambre since you can’t get hold of a decent version of Tabac Blond anymore except via fleabay and bankruptcy. I do like this one, and Idole *is* too wimpy for me (though I hear the edt is dc and only the edp is available now?). Gold Leather probably not on my buy list at all, but I do really like it. Something in the base reads like a bit of vetiver to me. I was pretty disappointed in Silver Iris, much as I love iris. It teeters on the line of “interesting” to me, but that’s not enough. Other leathers I like more? : Cuir Mauresque, Daim Blond, SMN Peau d’Espagne, PG Cuir d’Iris. None are as sweet and boozy as this one, but still, it didn’t feel like a must-have. I sure have enjoyed my small decant though, and would consider another. I like that *usually*, Atelier Cologne does 30ml sizes. Hopefully they will for this too, eventually. I think my favorite in the line is still probably Trèfle Pur. I’ve barely sampled Mistral Patchouli, but that’s good too, and I’m very curious about the Cédrat Envirant. Yep. And I think I tried the EdP, but not sure, and if I did can no longer remember how much more powerful it was. I probably need to try Trèfle Pur again.